of deep dermal burns. " Welcome to the SUPRATHEL U training platform – created by experts for experts. Have fun exploring the product SUPRATHEL®, its use and application. Please feel free to contact our experts by phone or email with any questions. SUPRATHEL® is a Class III medical device distributed in 36 countries across five continents. To date, more than 20,000 patients have been successfully treated in over 300 burn centers. SUPRATHEL® is based on polylactic acid and as an elastic membrane it mimics the natural skin. While being permeable to oxygen and water vapor it provides a physical barrier for microorganisms. 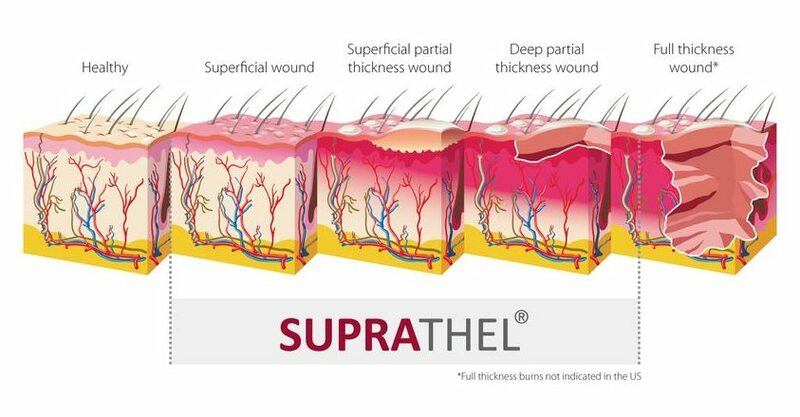 SUPRATHEL® is indicated in superficial (2a°) and deep dermal/partial thickness (2b°) skin loss diseases, such as burn wounds, split-thickness skin graft (STSG) donor sites, as well as trauma and surgical wounds. To learn more about the product please go to her www.suprathel.com or contact our experts. SUPRATHEL® is indicated for superficial and deep dermal/partial thickness 2nd degree skin loss diseases, areas (see white line in the burn classification for SUPRATHEL® indications). 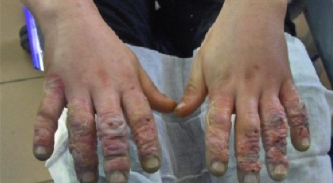 TEN (toxic epidermal necrolysis) is diagnosed in patients with an extensive loss of epidermis due to necrosis and a scalded-like appearance of the skin. TEN is the most serious drug-related skin eruption with a mortality rate between 11 and 70%. Patients with less than 10% of epidermal detachment are classified as having Stevens-Johnson Syndrome, while those with more than 30% of TBSA involvement are classified as having TEN. 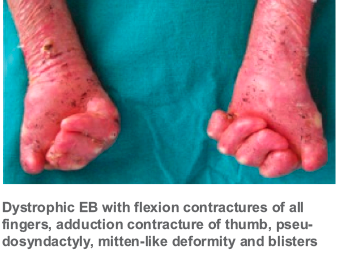 EB (Epidermolysis bullosa) is a genetic defect and not a disease. There are a few case reports in which SUPRATHEL® was used. The primary advantage for this indication is faster wound healing. SSSS is caused by infection with certain strains of staphylococcus bacteria resulting in skin damage with blisters, as if the skin were scalded. Frostbite is an injury caused by exposure of parts of the body due to freezing. SUPRATHEL® can also be ideally combined with autologous grafts, e.g. on top of expanded mesh grafts. In general, SUPRATHEL® can be applied to any body area in children as well as in adults. Due to its plasticity, it can be moulded and is especially suitable for difficult-to-treat areas such as the face, neck, hands and joints. In case of a reduced or even missing availability of split skin grafts, SUPRATHEL® is ideal to bridge the time gap until availability meanwhile reducing the area that needs coverage by split-skin grafts. Large affected areas can thus be temporarily covered reducing the risk of infections while providing immediate pain relief. As a basic rule, if the total body surface area (TBSA) is below 5% and pain management is the most important in the treatment plan, SUPRATHEL® should be the first choice. In children, all body parts can be covered with SUPRATHEL®. Even if the deep dermis is partially affected, SUPRATHEL® functions as a temporary skin substitute and does not integrate into the skin. 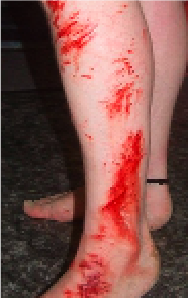 Insufficient debridement: consider surgical (sharp) debridement in deeper wounds. SUPRATHEL® applied too early after trauma: wait for 24 hours after trauma in case of deeper wounds. Consider Lavasept® / Hibiclens® dressing after debridement. Insufficient hemostasis: Use 1% adrenaline and warm towels. Consider light compression dressing during the first 1-3 days. Some users utilize stripes or staples around the edges to fixate SUPRATHEL®. Overlap of membranes should be 2-5 inches (the fatty gauze must be clearly larger than SUPRATHEL®). Avoid stretching the membrane when applying. 1-2 layers of fatty gauze should do. Be patient! Leave on wound. SUPRATHEL® – will peel off – after epithelialization. Just change outer dressing. Change to dry gloves before application. Avoid any heat sources (e.g. lamps) before application. The thin membrane gets warm quickly. Avoid too thick outer dressing, so the wound can “breathe”. Slow down! Give the wound time and rest to heal! What treatment is recommended for a contaminated wound? At first, thorough disinfection and debridement. Then administer a local or systemic antibiotic. Local application of a disinfectant on SUPRATHEL® and monitoring of the inflammatory process secured by transparency of SUPRATHEL® and fatty gauze. 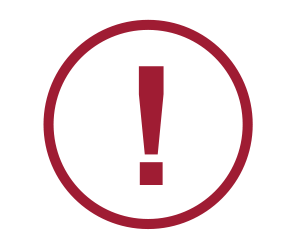 Can infections occur under SUPRATHEL®? After thorough debridement, SUPRATHEL® forms a physical barrier against microorganisms. It also reduces the pH-value of the wound, thus inhibiting growth of bacteria and viruses. In case of frequently which disinfectant can be used for debridement ? Which fatty gauzes are recommended to apply on top of SUPRATHEL®? Consider Lavasept® dressing after debridement. Insufficient hemostasis: Use 1% adrenaline and warm towels. Consider light compression dressing during the first 1-3 days. 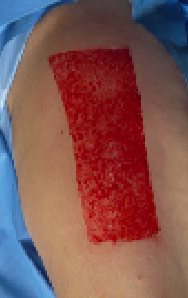 Some users utilize stripes or staples around the edges to fixate SUPRATHEL®. What are the storage temperatures? SUPRATHEL® is delivered in a cooling box keeping the temperature within this range. When the membrane is white and non-transparent, it is in proper condition. Baartmans et al. 2010: Baartmans MG, Dokter J, den Hollander JC, Kroon AA, Oranje AP. Use of Skin Substitute Dressings in the Treatment of Staphylococcal Scalded Skin Syndrome in Neonates and Young Infants. Neonatology. 2010 Dec 9;100(1):9-13. Baartmans M.G.A., Dokter J., den Hollander J.C., Kroon A.A. & Oranje A.P. (2010). Use of Skin Substitute Dressings in the Treatment of Staphylococcal Scalded Skin Syndrome in Neonates and Young Infants. Neonatology. 100(1):9-13. Behr et al. 2008: Behr B, Megerle KO, Germann G, Kloeters O. Neue Konzepte in der Oberflächentherapie bei Verbrennungswunden. -New concepts in local burn wound therapy. Handchir Mikrochir Plast Chir. 2008 Dec;40(6):361-6. Harenberg et al. 2010: Harenberg PS, Hrabowski M, Ryssel H, Gazyakan E, Germann G, Engel H, Reichenberger MA. Febrile Ulceronecrotic Mucha-Habermann Disease. Eplasty. 2010 Jul 16;10. Highton et al. 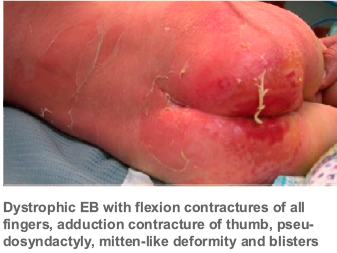 2013: Highton L, Wallace C, Shah M. Use of Suprathel® for partial thickness burns in children. Burns 2013 Feb;39(1):136-41. Kaartinen et al. 2011: Kaartinen IS, Välisuo PO, Alander JT, Kuokkanen HO. Objective scar assessment- a new method using standardized digital imaging and spectral modelling. Burns. 2011 Feb;37(1):74-81. Keck et al. 2011: Keck M, Selig HF, Lumenta DB, Kamolz LP, Mittlböck M, Frey M. The use of SUPRATHEL(®) in deep dermal burns: First results of a prospective study. Burns. 2012 May;38(3):388-95. Epub 2011 Nov 10. Kraemer et al. 2010: Kraemer B, Wallwiener M, Brochhausen C, Planck C, Hierlemann H, Isaacson KB, Rajab TK, Wallwiener C. A Pilot Study of Laparoscopic Adhesion Prophylaxis after Myomectomy with a Copolymer Designed for Endoscopic Application. J Minim Invasive Gynecol. 2010 Mar-Apr;17(2):222-7. Lindford et al. 2011: Lindford AJ, Kaartinen IS, Virolainen S, Vuola J. Comparison of Suprathel® and allograft skin in the treatment of a severe case of toxic epidermal necrolysis. Burns. 2011 Nov;37(7):e67-72. Epub 2011 Aug 17. Lumenta et al. 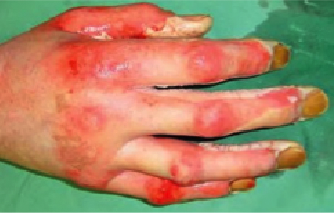 2009: Lumenta DB, Kamolz LP, Frey M. Adult burn patients with more than 60% TBSA involved-Meek and other techniques to overcome restricted skin harvest availability– the Viennese Concept. J Burn Care Res. 2009 Mar-Apr;30(2):231-42. Madry et al. 2011: Madry R, Struzyna J, Stachura-Kulach A, Drozdz L, Bugaj M. Effectiveness of Suprathel® application in partial thickness burns, frostbites and Lyell syndrome treatment. Pol Przegl Chir. 2011 Oct 1;83(10):541-8. Markl et al. 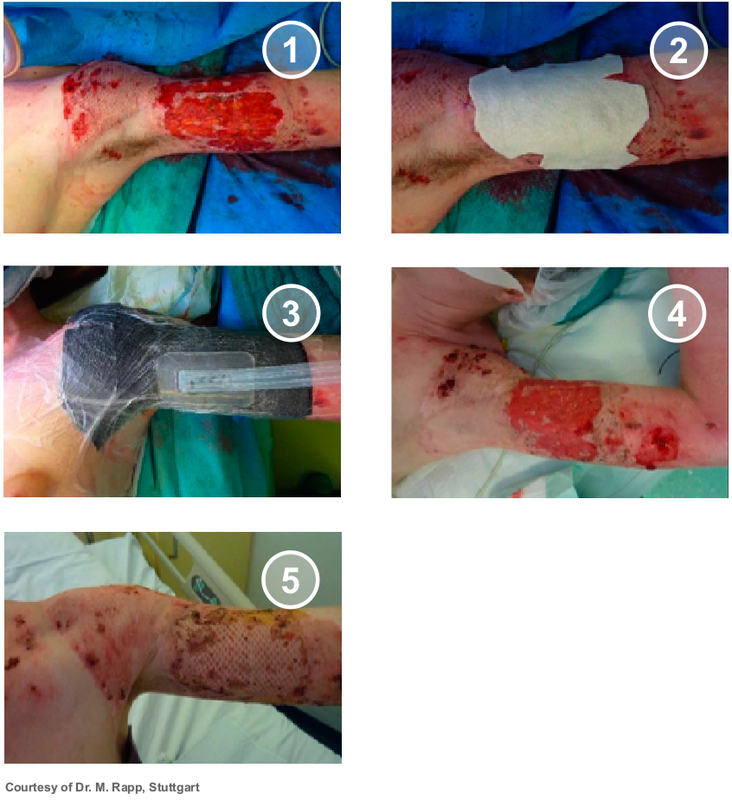 2010: Markl P, Prantl L, Schreml S, Babilas P, Landthaler M, Schwarze H. Management of split-thickness donor sites with synthetic wound dressings: results of a comparative clinical study. Ann Plast Surg. 2010 Nov;65(5):490-6. Merz et al. 2009: Merz KM, Wisser D, Sievers R, Reichert B. Erste Erfahrungen mit SUPRATHEL® bei zweitgradig oberflachlichen Verbrennungen im Gesicht. Plastische Chirugie 4/2009:213-18. Mueller et al. 2010: Mueller E, Haim M, Petnehazy T, Acham-Roschitz B, Trop M. An innovative local treatment for staphylococcal scalded skin syndrome. Eur J Clin Microbiol Infect Dis. 2010 Jul;29(7):893-7. Nolte et al. 2007: Nolte SV, Xu W, Rodemann H-P, Rennekampff H-O. Suitability of Biomaterials for Cell Delivery in Vitro. Osteo trauma care 2007; 15: 42-47. Pfurtscheller et al. 2008: Pfurtscheller K, Zobel G, Roedl S, Trop M. Use of Suprathel dressing in a young infant with TEN. Pediatr Dermatol. 2008 Sep-Oct;25(5):541-3. Rajab et al. 2009: Rajab TK, Wallwiener CW, Brochhausen C, Hierlemann H, Kraemer B, Wallwiener M. Adhesion prophylaxis using a copolymer with rationally designed material properties. Surgery. 2009 Feb;145(2):196-201. Rapp et al. 2007 : Rapp, M, Uhlig C, Dittel K-K. The Treatment of Mass Burn Casualties Resulting from Mass Disaster. Osteo trauma care 2007; 15: 8-16. Ring et al. 2011: Ring A, Tilkorn D, Ottomann C, Geomelas M, Steinstraesser L, Langer S, Goertz O. Intravital monitoring of microcirculatory and angiogenic response to lactocapromer terpolymer matrix in a wound model. Int Wound J. 2011 Apr;8(2):112-7. Ryssel et al 2010: Ryssel H, Gazyakan E, Germann G, Hellmich S, Riedel K, Reichenberger MA, Radu CA. Antiseptic therapy with a polylacticacid-acetic acid matrix in burns. Wound Repair Regen. 2010 Sep-Oct;18(5):439-44. Ryssel et al. 2010: Ryssel H, Germann G, Riedel K, Reichenberger M, Hellmich S, Kloeters O. Suprathel-acetic acid matrix versus acticoat and aquacel as an antiseptic dressing: an in vitro study. Ann Plast Surg. 2010 Oct;65(4):391-5. Ryssel et al. 2011: Ryssel H, Andreas Radu C, Germann G, Kloeters O, Riedel K, Otte M, Kremer T. Suprathel-antiseptic matrix: in vitro model for local antiseptic treatment? Adv Skin Wound Care. 2011 Feb;24(2):64-7. Schwarze et al. 2007: Schwarze H, Küntscher M, Uhlig C, Hierlemann H, Prantl L, Noack N, Hartmann B. Suprathel, a new skin substitute, in the management of donor sites of splitthickness skin grafts: results of a clinical study. Burns. 2007 Nov;33(7):850-4. Schwarze et al. 2008: Schwarze H, Küntscher M, Uhlig C, Hierlemann H, Prantl L, Ottomann C, Hartmann B. Suprathel, a new skin substitute, in the management of partial-thickness burn wounds: results of a clinical study. AdhesionAnn Plast Surg. 2008 Feb;60(2):181-5. Uhlig et al. 2007: Uhlig C, Rapp M, Dittel KK. Neue Strategien zur Behandlung thermisch geschädigter Hände unter Berücksichtigung des Epithelersatzes Suprathel. -New strategies for the treatment of thermally injured hands with regard to the epithelial substitute Suprathel. Handchir Mikrochir Plast Chir. 2007 Oct;39(5):314-9. Uhlig et al. 2007: Uhlig C, Rapp M, Hartmann B, Hierlemann H, Planck H, Dittel KK. Suprathel-an innovative, resorbable skin substitute for the treatment of burn victims. Burns. 2007 Mar;33(2):221-9. Uhlig et al. 2007: Uhlig C, Hierlemann H, Dittel K-K. Actual Strategies in the Treatment of Severe Burns – Considering Modern Skin Substitutes. Osteo trauma care 2007; 15: 2-7. We appreciate your comments on the content of this new website. Let us know what we can do to meet your needs. Welcome to the SuprathelU (US) – training platform – created by experts for experts. Have fun exploring the product SUPRATHEL®, its use and application. Please feel free to contact our experts by phone or email with any questions.